she did not spend last nigh tin box either . 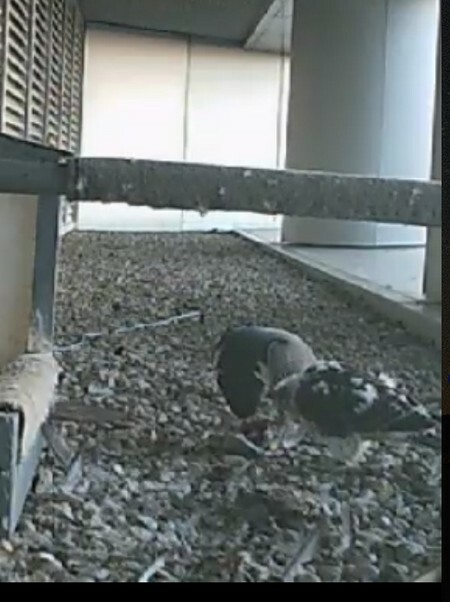 Big oops...she missed the step up..
Self feeding...not sure how well she did..
Lots of preening, stretching, and false alarms while waiting for breakfast. Blue was in the right place at the right time. 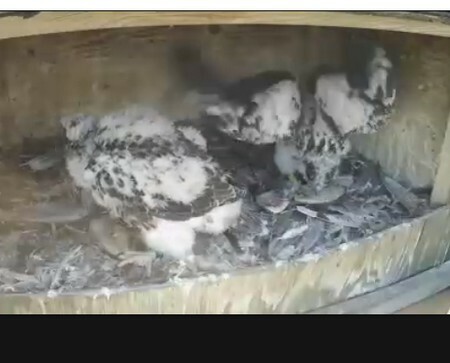 After breakfast...gonna be tough to watch while they are on the perch. so far chick is doing alll right things. She gets speed going down the runway and now gets air also. please stay off corners. she has lost a lot more fluff yesterday. i am so hopping mad. I just spent a half hour writing a report and it poofed so I will try again tomorrow. I am too tired tonight. it was a good one too. tomorrows may be rushed. we started the watch last Sunday. everything has been going well so far. those o f you who have followed here, know that Peter and I do not take pitures while on watch. 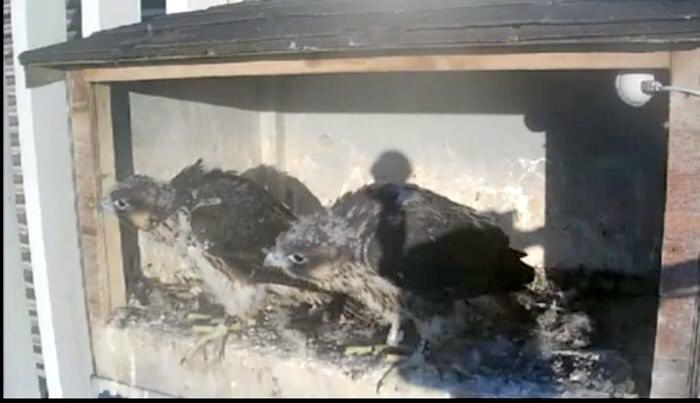 We wait until the kids have the air under their wings. you can lose sight of things. It has been nice seeing Radisson and Chase soaring and flying and showing the kids what to do. 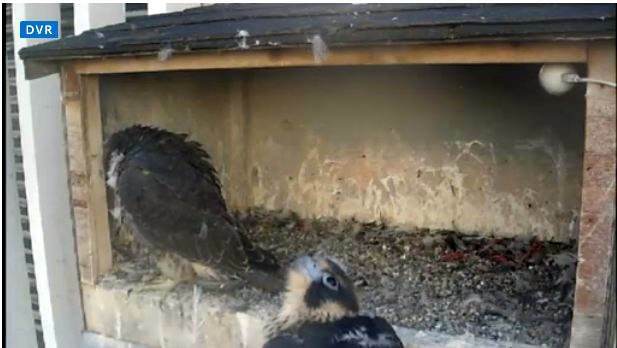 We have watched as both have tried stooping in area. Chase always puts on a show. He is amazing to watch as he weaves in and out and tucks in for his dives ,but when he teaches the kids these things, we cringe. 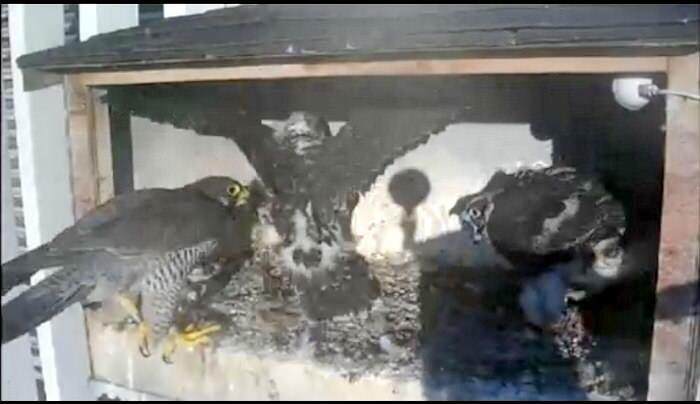 Radisson is just a beautiful strong falcon. I saw RAdisson fly over to the moon on the suite hotel, yesterday, for the first time this year. If you have followed this site for years you will know it has been one of Radissons favorite spots. 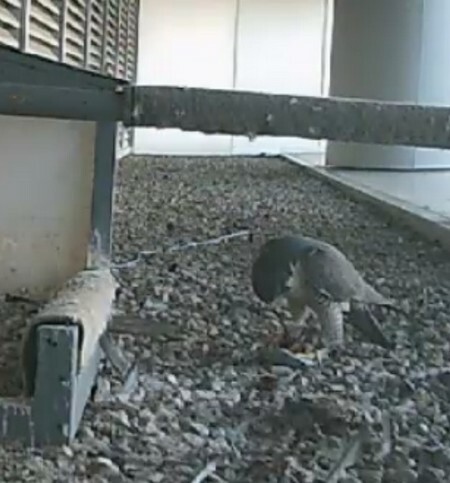 She had prey stashed there and brought it over for the kids. 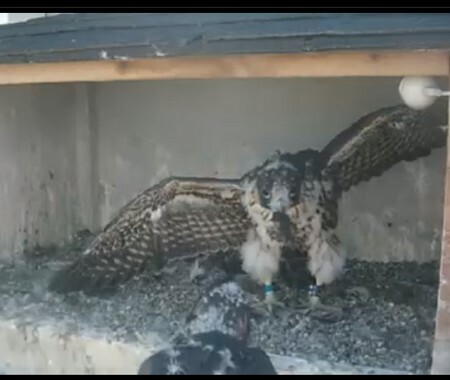 Then she reached another milestone and went over to the netting to right of box. ( while Peter and Lisa were there) When they first built the white structure, years ago, we cursed it as it became a trap for the kids But then Gord, put a netting on it and it has become an extension of the launch pad. During my shift, it got a little hairy. 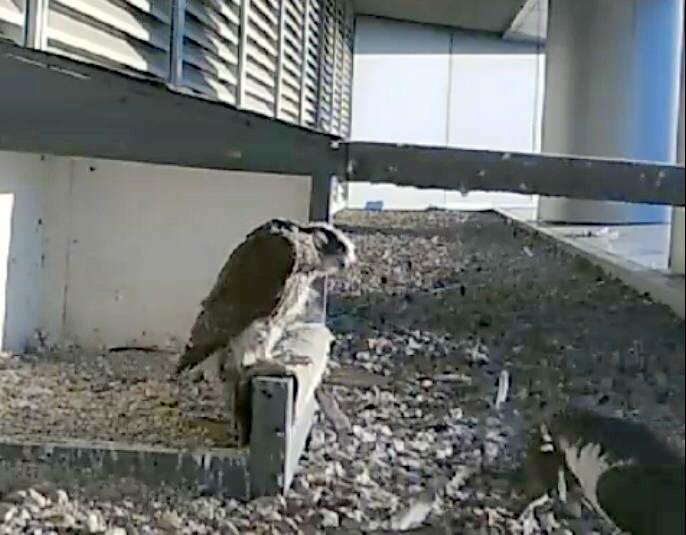 We had two legged intruders on roof. 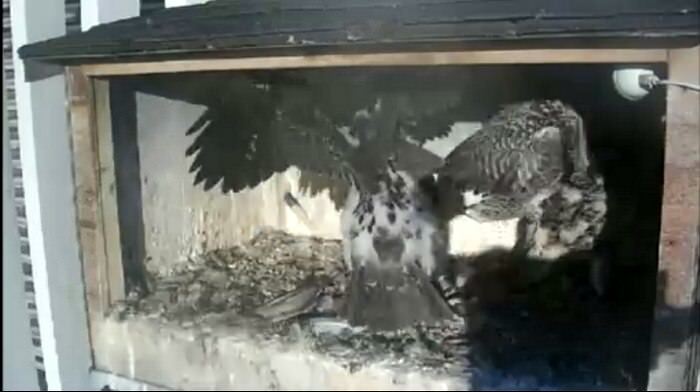 Poor Radisson and Chase were frantic and were non-stop dive bombing. Lisa and I were cheering them on. I had Peter call our contacts as this just continued for about an hour. Lets just say our contacts were not happy, as it is an off limits zone. AS I was leaving, a huge storm was blowing in . Our next two shifts had their hands full. 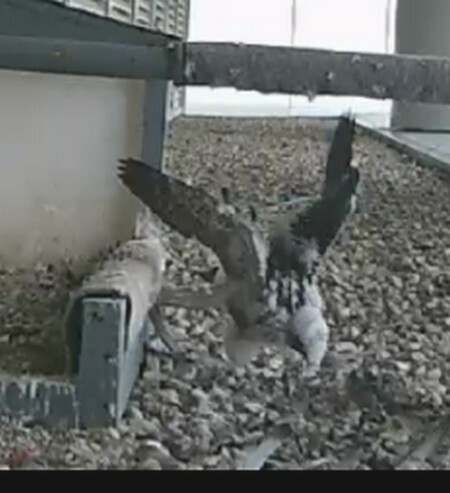 Of course, silver decided at that point to go back to the netting. Radisson fed her there, and then silver hunkered down as it poured rain and the winds really blew( the storm was downgraded from tornado watch to storm watch). Marge texted me, that Radisson was almost slammed int Maz, as she tried to bring prey over. So imagine if our kids were out there flying. RAdisson has always been freaked out by thunder and tonight was no exception. 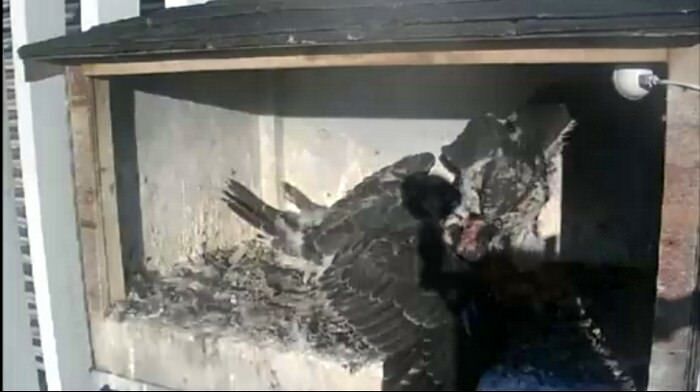 Ground reports say she was frantic, If you could have seen her come into box, you would have known. and we have a week of fireworks to go yet, as our exhibition is on. 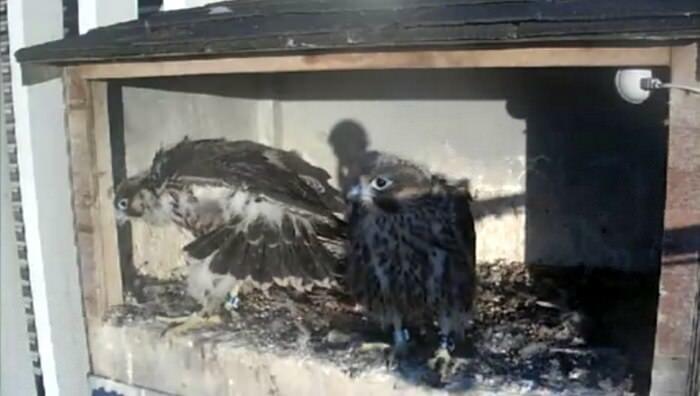 the storm blew over eventually, and Green , who was starved, came onto perch for first time. Silver stayed on netting. 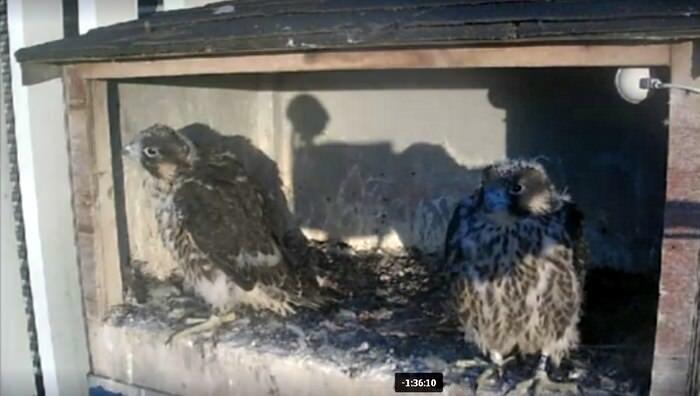 So the evening ended with both females in the box, and I presume Chase turned in , with RAdisson hanging around the box area. Now the nail biting begins And I never like to be there on first flights. My heart , just cannot take it. but since I am scheduled every day, what are the chances. Uof A All the racket you are hearing is a rescue underway. Everyone is fine, kid, parents and rescuers. Bev will fill you in later today. 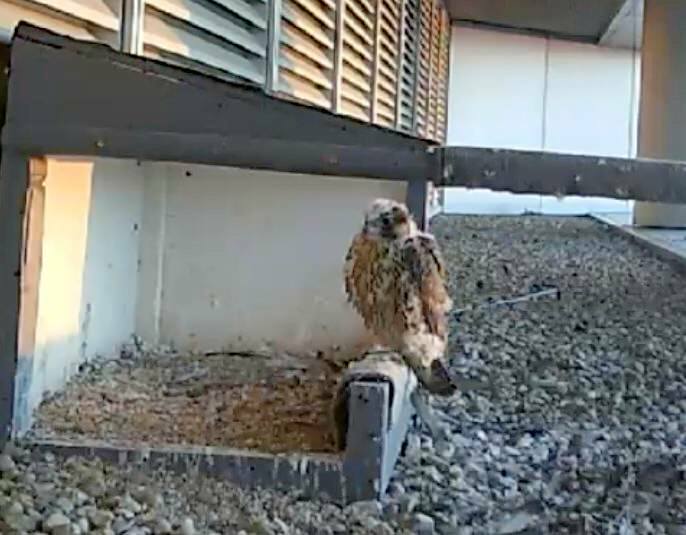 Fledge watchers are run off their feet this morning as there is another one on the lam at Weber as well. So far all is well,there too. Glad to hear there was a rescue...can't wait for the report.. The lamp light is still on and not a vehicle up on the top of the parkade. Slowly, \I turn off the truck with parking at the perfect angle to watch from. Roll down the window and the chilled air rushes in to greet me. The only sound is of the magpie, I wonder? could I train it to sing a different tune. 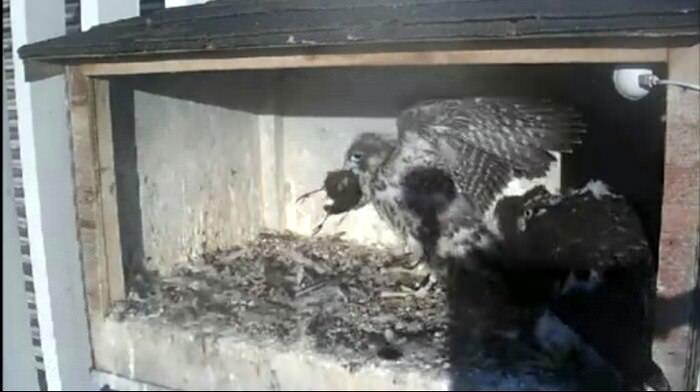 hmm Then out of the silence comes the chatty girls at the nest box. 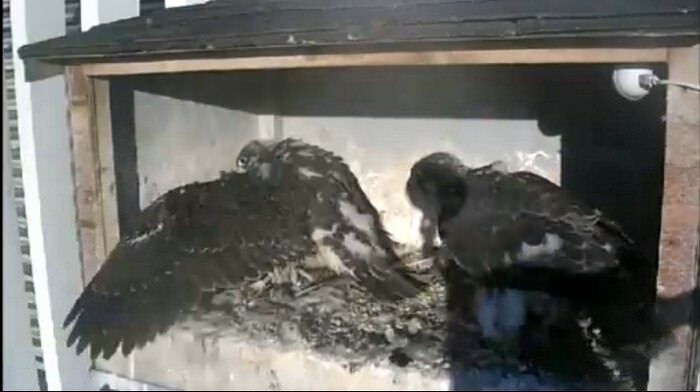 One sitting on the netting, the other perched on the nest ledge. They must have seen R or C, but I haven't . I love the mornings with little sounds of traffic and human activity. Seating here , I day dream. I know that they call a group of crows a murder, but I really would like to murder the noisy magpies. Off comes the lights on the lamp posts one by one. Does that mean that it is time to start the day? 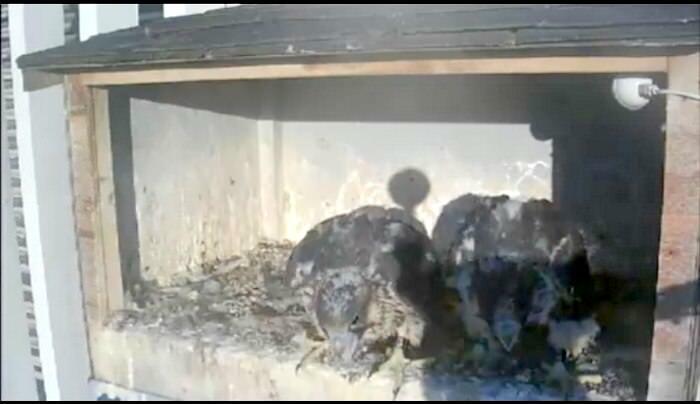 the sun has now hitting the nest box and Radisson has just arrived and sitting off to the left of the nest on a pole. She could have been there all along. 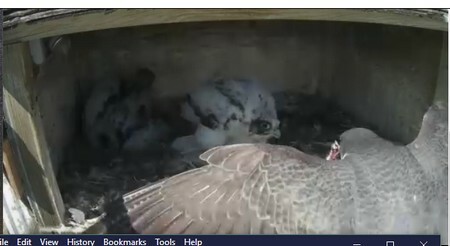 A little bit of a feather storm coming from the nest, netting girl is getting her flapping practice out there for fledge. 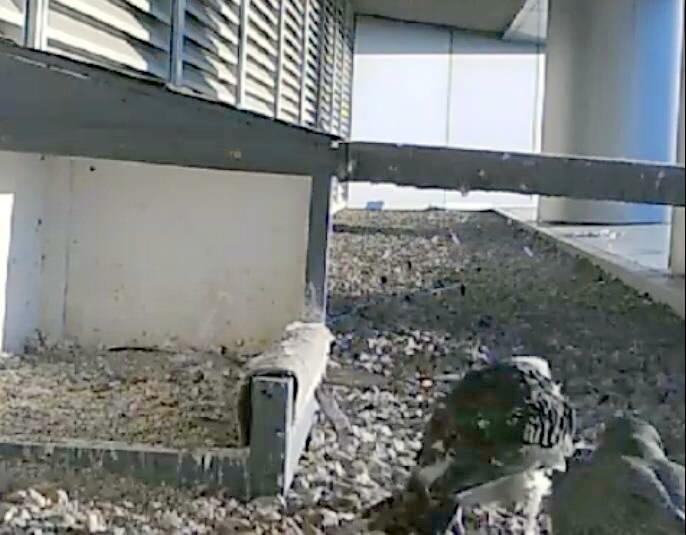 The shadows of the building across the way is creeping along the nest area with crisp clean lines. In coming a parent with food(chase). 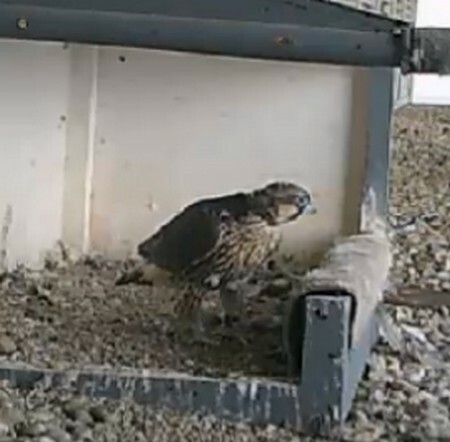 Netting girl was in a tizzy to get back to the nest to eat. all the meals that I have seen arrive( in past) . this is a first to see it come from the right. unless it is being cleaned on the Mas. there still is water puddles up here from last nights rain. Funny thing is that you don't have to see a pigeon fly, because you hear it with it wings hit against each first. Lisa and I say a bird fly down below the nest and land. It was not a parent and it was there for awhile. 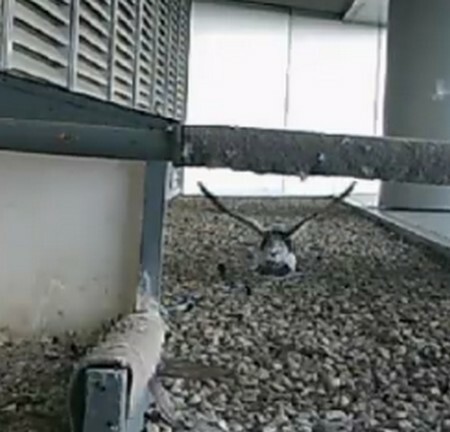 Until, Radisson come off the pole and dived at it and around the building, out fly the bird and Radisson. I had to laugh at this point, because it was a pigeon. Oh, no kayking . 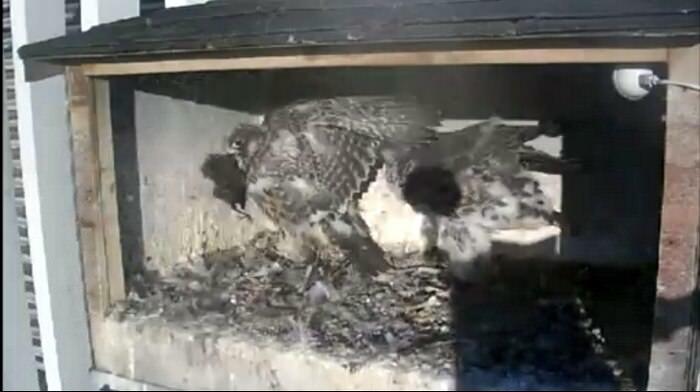 Off both C and R and dive bomb people on the roof of the Maz. Might have been the security guards that were walking around on the parkade. Didn't last long, that is good. Off again comes Radisson from the pole kaying at something. Not people this time. just crows and the dive bombing is going on as Lisa comes to watch. Peter, comes to take over from me. I full him in on the morning events and need to say my goodbyes, because I have 1 acre of raspberries to pick. 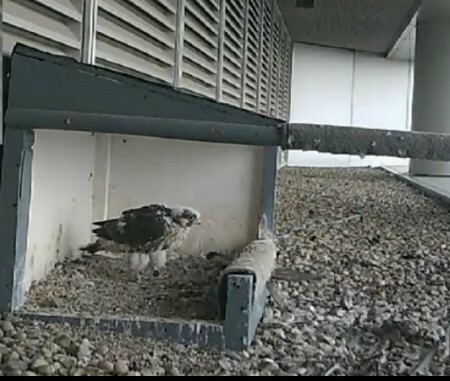 Went to pickup my chair turned to see Silver come of the nest, around the clinical science building but she was not gaining height. Down she came between the two building. 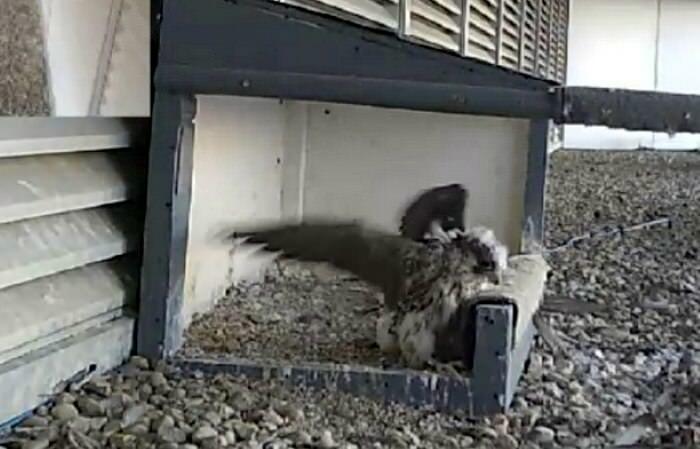 I ran over to see her hang on to the side and then loss hold and come down lower onto the 3 floor ledge. 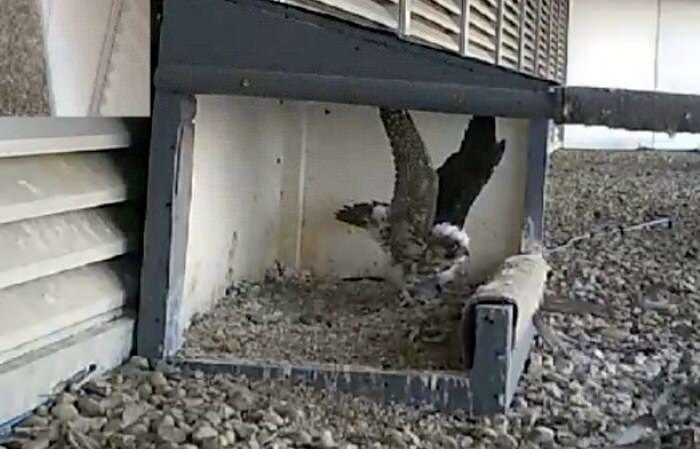 Peter and I raced over to see if we could get a peek at her from the Mas. Yes, we found her and would need to get rescued. Peter was on to the phone with Bev when she came off. Now we had to update her and get the right phone number to security. 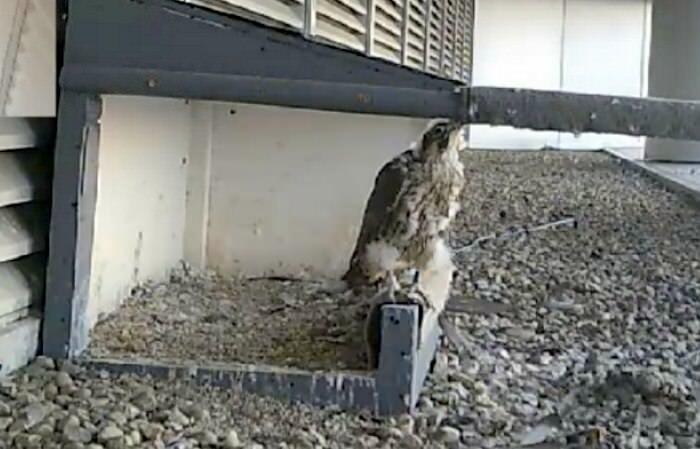 Lisa , the new watcher stayed on the roof to watch Green girl that was still at the nest. Peter and I got into the building then had to find a door. LOL Just before we opened it, I stopped them because she was right there on the ledge facing out to the road . 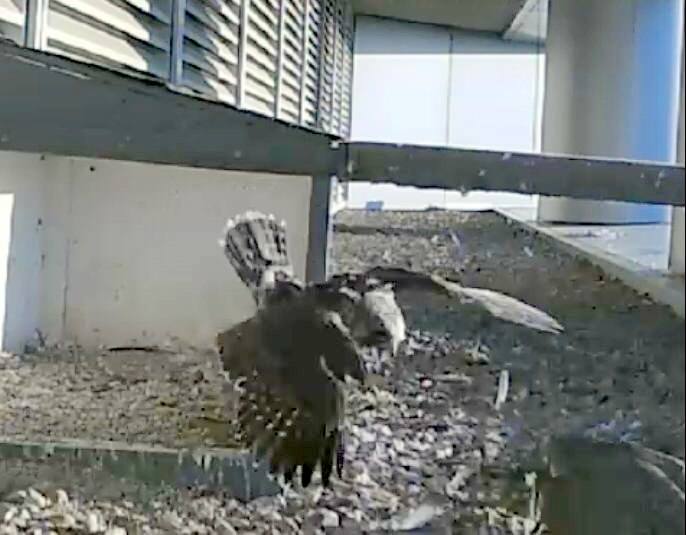 Peter , slowly got in front of her an she turned around and landed on the roof. 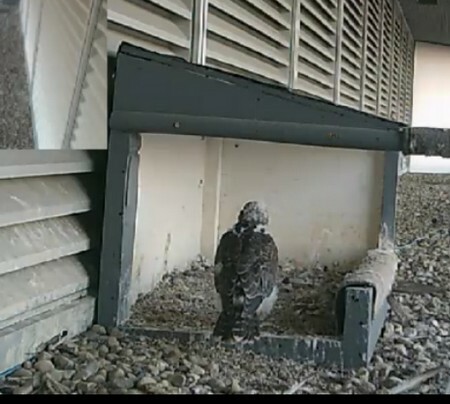 At the time I went out and with help from the guard we made a line for her not to turn back to the ledge. Just, a few feet from her she bolted back to us. the guard slowly put her hands down and I had a chance to get into front of her again. 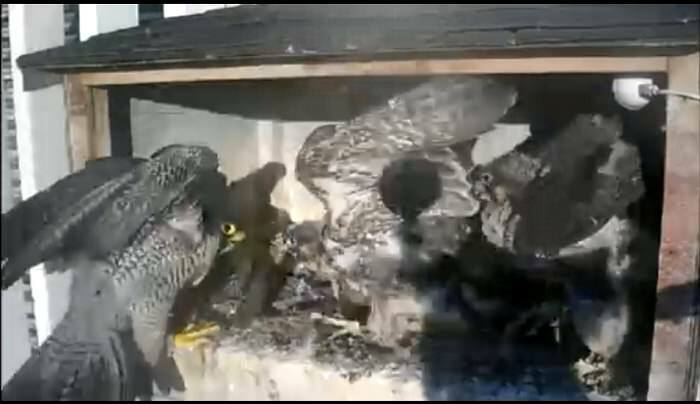 both of us ladies were close enough to touch her, but we needed Peter to come up behind her and catcher her(to prevent wing damage). 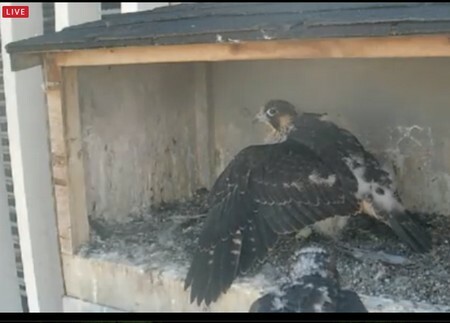 Just like that Peter scooped her up and off to the box she goes. I left after this, so now it is Bev's turn at the out come. WOW...great report, Westend Old Bird!! 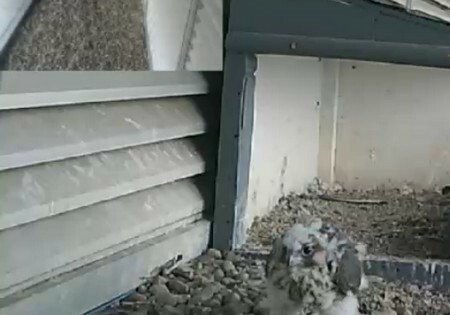 I've kept the cam up all evening. 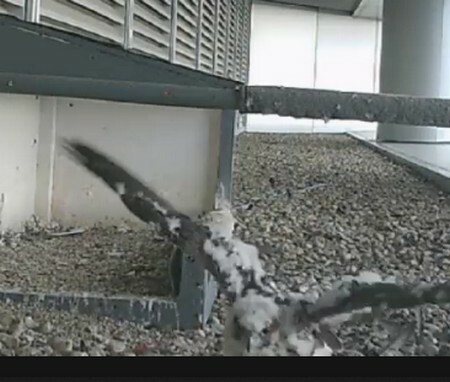 Nothing much to report from the cam...a few times, I thought Green had fledged...but, just as soon as I was convinced, a wing would pop into view. Gotta call it a night...very early start for me tomorrow...but, certainly will look forward to your report, Bev and Peter...that is, if you have the energy to post it after your long day. and thank you emyrauld for psoting what was happening at the site, so people would know. will write up mine tomorrow. cannot keep my eyes open at this point. thank you westend for letting peter sleep in again tomorrow. praying for success everywhere this year. july22 u of A no time for report but silver was rescued wee hour of morning. was in perfect health and so she was put back up. curse of all curses , she just flew again , and peter on way back down. they have lost sight of her. hopeuflly she was ready this time and is O.k. Sunday is suppose to be a day of rest. Someone forget to tell Silver that. In the wee hours of the morning she ended up in the emerg at the U of A. With miss calls to P and B they found a number to one of the other rescuers. Up she pops and down to the emerg to get her covered and wait for back up. Mike to the rescue with Trish in hot pursuit. They waited a few hours to break the news to P and B. (chuckle) and dropped off her to them. Peter waited a few more hours to phone Patty to get her checked out. In all this time, I am looking for Silver. Peter told me where she was last seen before turning in. Got there and one pillar over was a bird laying down on the post. Green was chattying up a storm to any parent that might listen. I swear I took my eyes for only a second and that bird on the pillar was gone. Oh Oh... 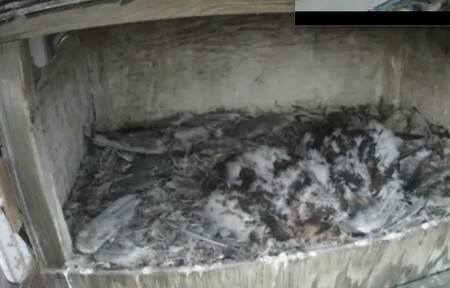 I have watched enough fledge that there was no one in the air. 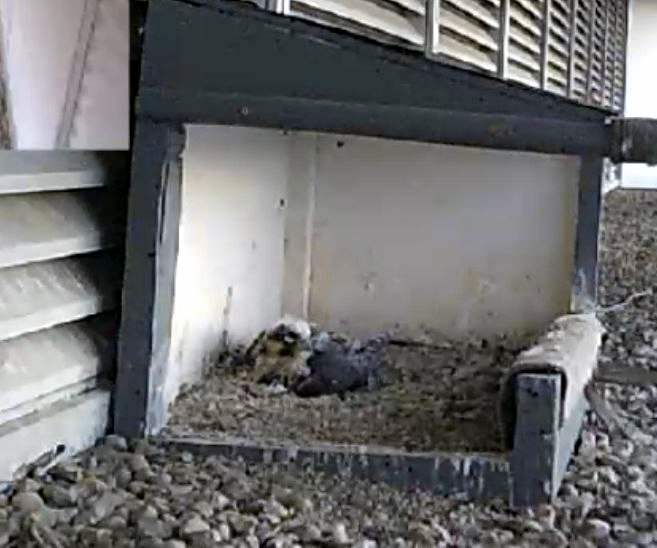 Ok just maybe it hoped back onto the wall and down under the nest area. 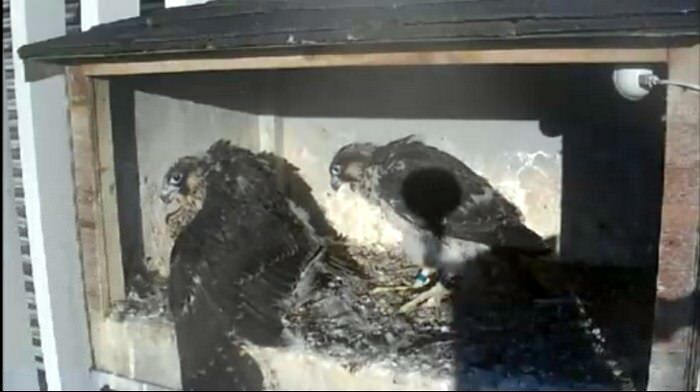 Just as that thought crossed my mind, 3 falcons are in the air. 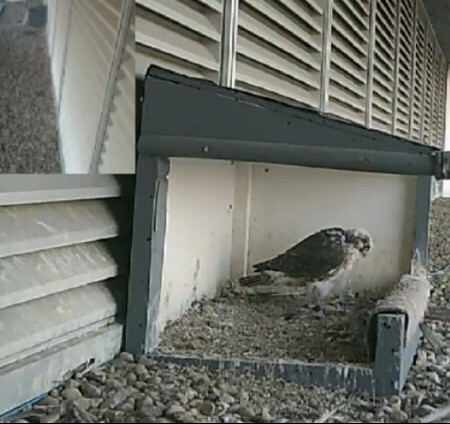 Green is in the box looking on the all the flying around that they are doing. It can't be Silver .. reason for this thought.. I saw her come down yesterday, with no height gained. 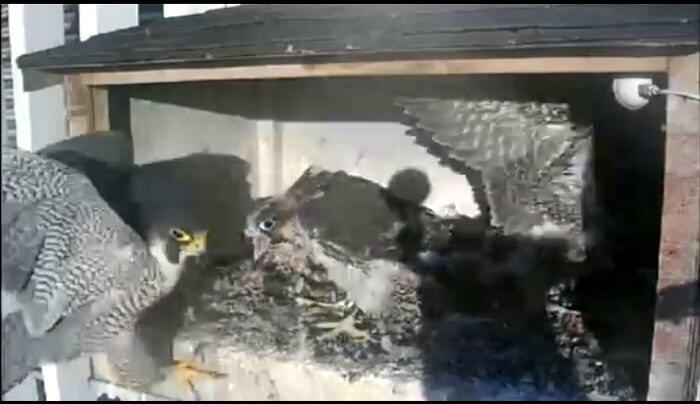 Ok. time to phone Peter and tell him what I see, and can he hear 2 chicks on camera. I look at my phone and there is a message saying he has Silver at home.. hmmmm THEN who is flying, after a few minutes 2 of them went off to the north and only one came back. 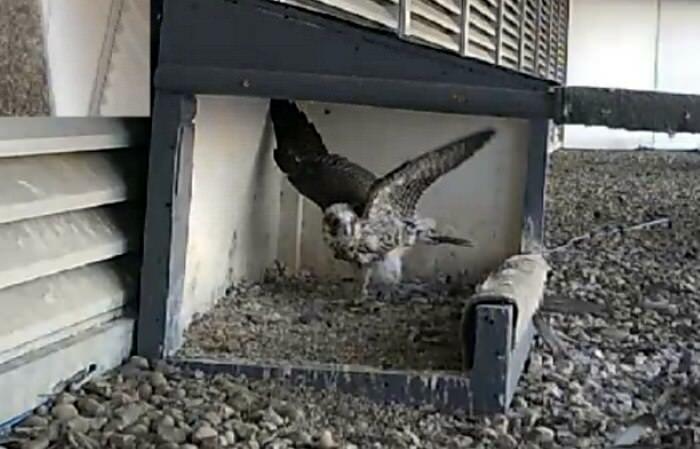 Radisson on the camera and Chase stayed right below the nest. 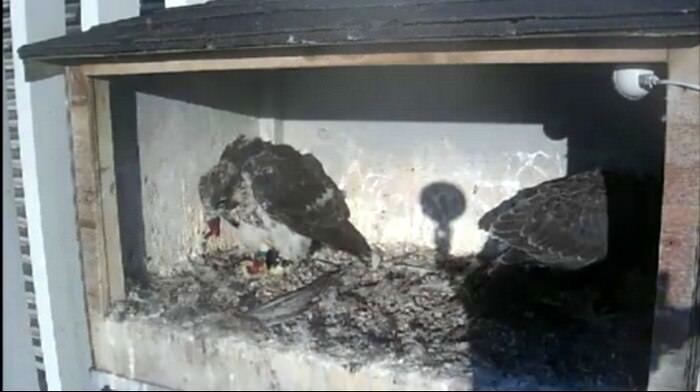 Peter said that it was probly a young one that they gladly showed the way out of their area. I stayed there waiting for Peter to come, he had Silver with him. Up to the nest area she was going. It takes Silver the same amount of time that it took Peter, came over to us, to pop back onto that same pillar. 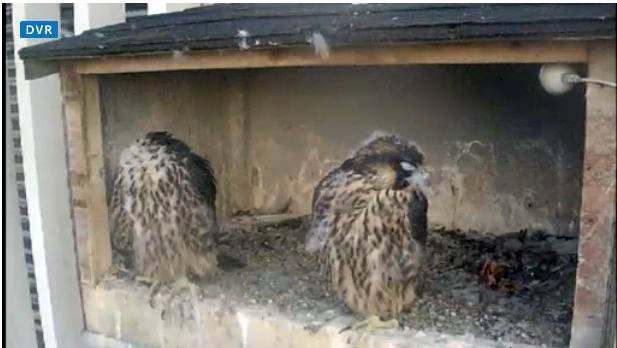 Just to get a hint of how windy it is in the area, Chase was on the Mas and he looked like a chick with all the fluffy feathers. Have a safe flight Silver , even if you would not stay put..
will try and do a report later. thanks west End . well , silver took off form her spot way far away, bu tI had ot keep my eyes on green and Peter was down watching silver , where she was. so whe peter saw her take off toward my area , he could not dial or run fast enough. We lost her. Brenda cam e down and Lisa was there also. Brenda and I looked all over. combed the area. I fill fil in more later but she was found on a car, and Peter adn Janice did th erescue. she has been examined adn is very feisty and not a mark on her, but she needs to loose a fe wounces. so she will go to the hack site. I will explain later , why. gord explained why she was flying strong and then just loosing gas. anyhow she is in our home for a second night. hopefully green will do well. she seems more patient. WOW...Silver is keeping everyone hopping!! 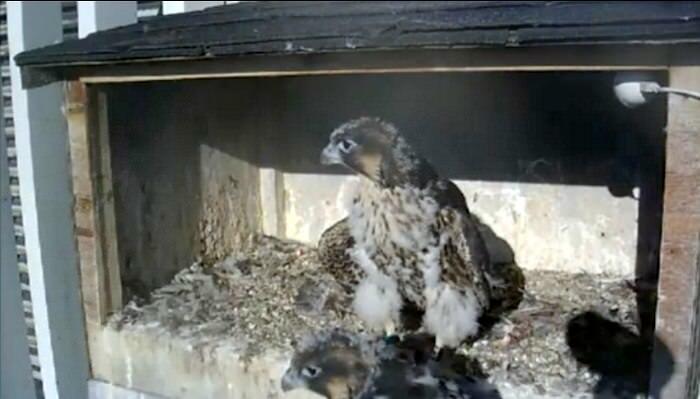 AS I type, Green is quietly sitting on the perch, with only a shoulder showing...Hope she stays like that! !